The vestibulocochlear nerve is the eighth paired cranial nerve. It is comprised of two parts – vestibular fibres and cochlear fibres. Both have a purely sensory function. 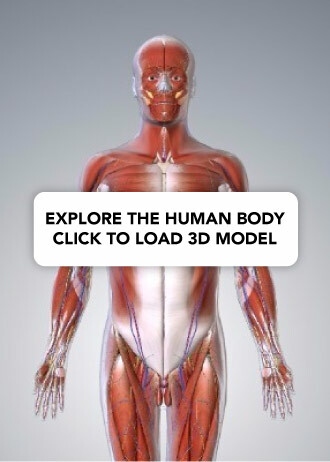 In this article, we will consider the anatomical course, special sensory functions and clinical relevance of this nerve. Vestibular component – arises from the vestibular nuclei complex in the pons and medulla. Cochlear component – arises from the ventral and dorsal cochlear nuclei, situated in the inferior cerebellar peduncle. Both sets of fibres combine in the pons to form the vestibulocochlear nerve. The nerve emerges from the brain at the cerebellopontine angle and exits the cranium via the internal acoustic meatus of the temporal bone. Within the distal aspect of the internal acoustic meatus, the vestibulocochlear nerve splits, forming the vestibular nerve and the cochlear nerve. The vestibular nerve innervates the vestibular system of the inner ear, which is responsible for detecting balance. The cochlear nerve travels to cochlea of the inner ear, forming the spiral ganglia which serve the sense of hearing. A basilar skull fracture is a fracture of the skull base, usually resulting from major trauma. The vestibulocochlear nerve can be damaged within the internal acoustic meatus, producing symptoms of vestibular and cochlear nerve damage. Patients may also exhibit signs related to the other cranial nerves, bleeding from the ears and nose, and cerebrospinal fluid leaking from the ears (CSF otorrhoea) and nose (CSF rhinorrhoea). The vestibulocochlear nerve is unusual in that it primarily consists of bipolar neurones. It is responsible for the special senses of hearing (via the cochlear nerve), and balance (via the vestibular nerve). The cochlea detects the magnitude and frequency of sound waves. The inner hair cells of the organ of Corti activate ion channels in response to vibrations of the basilar membrane. Action potentials travel from the spiral ganglia, which house the cell bodies of neurones of the cochlear nerve. The magnitude of the sound determines how much the membrane vibrates and thereby how often action potentials are triggered. Louder sounds cause the basilar membrane to vibrate more, resulting in action potentials being transmitted from the spiral ganglia more often, and vice versa. The frequency of the sound is coded by the position of the activated inner hair cells along the basilar membrane. The vestibular apparatus senses changes in the position of the head in relation to gravity. 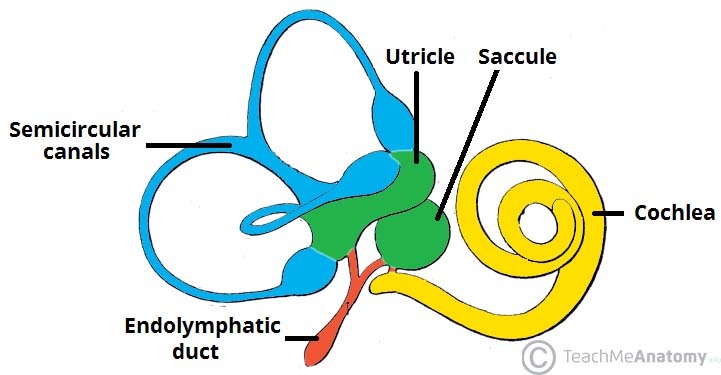 The vestibular hair cells are located in the otolith organs (the utricule and saccule), where they detect linear movements of the head, as well as in the three semicircular canals, where they detect rotational movements of the head. The cell bodies of the vestibular nerve are located in the vestibular ganglion which is housed in the outer part of the internal acoustic meatus. Information about the position of the head is used to coordinate balance and the vestibulo-ocular reflex. The vestibulo-ocular reflex (also called the oculocephalic reflex) allows images on the retina to be stabilised when the head is turning by moving the eyes in the opposite direction. It can be demonstrated by holding one finger still at a comfortable distance in front of you and twisting your head from side to side whilst staying focused on the finger. Fig 1.1 – The components of the membranous labyrinth. Vestibular neuritis refers to inflammation of the vestibular branch of the vestibulocochlear nerve. The aetiology of this condition is not fully understood, but some cases are thought to be due to reactivation of the herpes simplex virus. Vertigo – a false sensation that oneself or the surroundings are spinning or moving. Nystagmus – a repetitive, involuntary to-and-fro oscillation of the eyes. Loss of equilibrium (especially in low light). Labyrinthitis refers to inflammation of the membranous labyrinth, resulting in damage to the vestibular and cochlear branches of the vestibulocochlear nerve. Tinnitus – a false ringing or buzzing sound. Through which structure does the vestibulocochlear nerve exit the cranium? Where are the cochlear hair cells located? Which cranial nerve is the vestibulocochlear nerve?